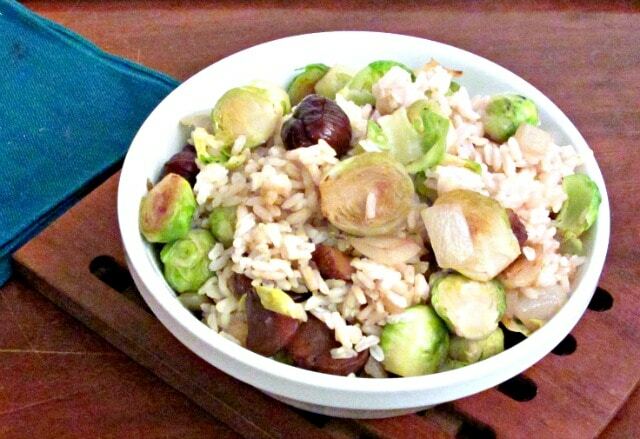 Brussels Sprouts and chestnuts, tossed in cooked rice, for a festive and delicious winter side dish. Perfect on a holiday table! When I was in college, I came home for my first Christmas break, and went into mid-town Manhattan to finish my shopping, and see the lights and decorated windows. (Remember – I lived in Manhattan… this was coming home, for me.) And suddenly, walking down the streets, I thought “Now it feels like New York at Christmas!” It took me a minute to figure out what had just happened, and then I realized. I smelled chestnuts. When I was young, all winter, there were hot chestnut vendors on every street corner in the business and shopping districts, and the smell of the chestnuts told me I was home. The irony is that I never ate those chestnuts… I rarely ate from street vendors, growing up… and I never did eat chestnuts, much. They were infrequently available in stores, quality varied when they were, they’re a bit fussy (I burned the last batch, though I think that was just my ignorance) and they were just never really on my radar, so to speak. Here, people usually eat them roasted as a snack, and I just don’t really snack much. I’d used puree once, though, in a souffle, and I knew there are soup recipes, and that Chestnut Rice is a favorite Fall and Winter dish in Japan, and kept thinking I should try them again. So then I poked around my fine collection of cookbooks to find ways to use them. I tried some in plain rice, and liked them. (I may try freezing them to use later…) And I found a couple of recipes with Brussels sprouts, and I do still have Brussels sprouts. The recipes I found, though, had you cooking everything to death (which could be the reason so many people hated Brussels sprouts…) so I wasn’t going to use them – but I did think it would be a good combination. I chopped a small onion (don’t all my savory recipes seem to start that way?) and sauteed it in a pan, then added trimmed Brussels Sprouts, the larger ones cut in half for plenty of surface, the smaller ones left whole. Sauteed them in the hot pan until they started to brown, then added chestnuts. (I left them whole for this – pretty pictures and all that – but you may want to cut them in half or smaller. A whole chestnut in a forkful of rice can overwhelm the other flavors, instead of complementing them.) Sauteed all that a bit more, added some water, which promptly boiled up in the hot pan, to finish cooking the sprouts. 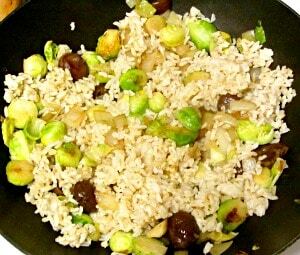 Brussels Sprouts and chestnuts, tossed in cooked rice, for a festive and delicious winter side dish. Heat oil in pan. Saute onion in pan until soft. 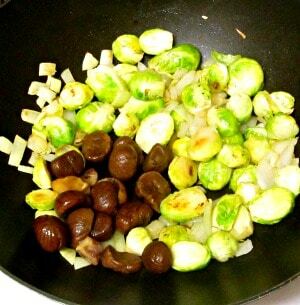 Add sprouts to hot pan, and let brown, stirring occasionally. Add chestnuts, stir. Add 1/4 c water and let it simmer to finish cooking the sprouts. Stir in cooked rice, add a pinch of salt, and heat through. Can you get a bag of peeled chest nuts like that in the photos? Lucky you. Chest nuts is my favourite but I can't get any good chest nuts here in Australia. I'd never seen them before this - and I'm fascinated! I probably used them more this week than in the last five years, because they're so easy. And I wanted to tell people this exists - because I would ever have looked for it. I do feel lucky! Love this recipe. Nice and simple. I visited NY in the winter once and I clearly remember the smell of roasted chestnuts - yum. Thank you. I was (alarmingly) near Rockefeller Center yesterday evening - took one look at Fifth Avenue and went back to Madison like a good little New Yorker to avoid the mob scene. But I was close enough to smell chestnuts from a vendor on the corner... I think the first one I've seen this year. CHESTNUTS ARE THE BEST, so I am sure this recipe is just what I will love! Thanks for sharing! Love the ingredients. I have a friend who grows chestnuts so always looking for new ways to have them. They are much underrated as are the brussel sprouts. Oh, that's great! This has been interesting, because I never really ate them very much... some of the "fresh" ones I'd gotten years ago were in poor shape, and that put me off them. (Just as that is a problem with Brussels Sprouts, for some people - if you've only had them already yellowing, and then overcooked, you're not going to like them!) I was really amazed how sweet the chestnuts are... They were a marvelous accent in this dish, and I am also looking for other uses! Everytime I see recipes like this one I can't believe I haven't tried cooking with chestnuts yet! I better get going and this one looks perfect. Thank you! As I said, it's new to me, too - and so rewarding. I love chestnuts. When I lived in Turkey we used to get candied chestnuts and those were really good too! That would be delicious! I've been fascinated by how sweet these are. I'm not used to thinking of nuts as sweet. How lovely! Hope you enjoy it! I've never eaten a chestnut before- I've always heard they're hard to peel!!! LOL - that's why when I saw the already roasted and peeled ones I grabbed them... It's not really that they're all that hard, though. It's more that - well, no one expects you to shell every almond you use in baking... we can buy them both in the shell for snacking and ready to use. Chestnuts haven't typically been available (except in the form of usually-sweetened puree in gourmet shops.) There is some fuss involved in roasting and peeling - and they do need to be roasted before they are peeled. 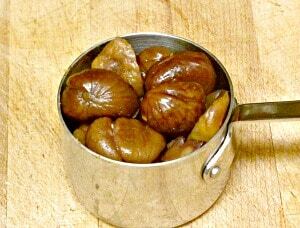 The smell and flavor of fresh roasted chestnuts is amazing, though... Worth trying! MY FIL is from Italy, and chestnuts always remind him of his childhood. He absolutely LOVES them, and I always enjoy finding new ways to use them. This dish looks like it'd be a big hit for the whole family! I hope you all enjoy it! Isn't it wonderful when we can do something special like that for someone we love? My family would love this dish! I remember I did try roasted chestnuts from a street vendor many years ago and the flavor was incredible! Thanks for sharing. It is so good - and so rich! You're welcome, and thank you! Roasted chestnuts are wonderful! I have never thoughts of incorporating them into a dish! Sounds wonderful! Thank you! 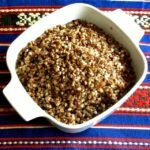 They're so good - and it does make a little go a long way... Next time you have some roasted ones, just put some aside and try this! I have always wanted to try roasted chestnuts! They are so hard to find here, and the quality is always really questionable. Add to that they are really expensive, and I just haven't bought them! This looks awesome, though - love that you combined them with brussel sprouts!! I never know what to do with chestnuts but I've always wanted to try - I'm going to start with this recipe! That's kind of where I was... then I bought some, and had to start exploring! But they are so good, and I'm planning to use them from here on. I hope you enjoy this as much as we do! Well, glad to help... (trigger craving? LOL) Thank you! 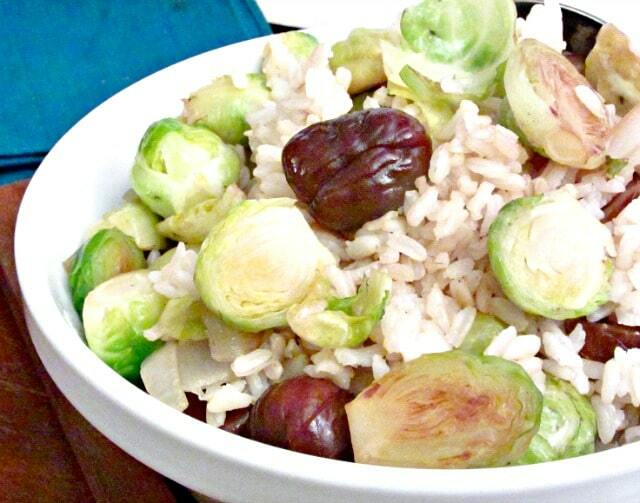 They really are amazing in rice, and the Brussels sprouts just add another layer of flavor to set them off! You know...I've never used chestnuts before! I've used water chestnuts but clearly that is 100% different! Loved your story about feeling like Christmas and I bet is smelled like Christmas to when you made these chesnuts! Oh, totally different! These are tender, nutty, and startlingly sweet and rich. The smell really comes when they're being roasted, so I did miss out on that - but the taste! And the fresh ones come into season here around now - many people use them in Thanksgiving stuffing, so I though I'd go ahead and Share my old post about another way to use any that are left! Also in Rome, I was used to the smell of roasted chestnuts being sold on the streets. I love them! And I've never had them in combination with Brussels sprouts, or with rice. Interesting recipe, must taste really good! Isn't that smell wonderful? Thank you! The combination was new to me when I made it, but I've repeated it now - we love it! I hope you enjoy it, too! Chestnuts bring back so many memories of my childhood. My Italian parents loved chestnuts and my mamma would roast them in the oven. Hubby doesn't like them so I haven't had them in a long time. I think I'll get some and add them to some dishes like this one :-) I bet he'd like them then. It's interesting - I'd never really thought of them as Italian, but obviously they are! He may well! You can start with a smaller amount ;-) and I would definitely cut them up. I left them whole for the sake of Pretty Pictures, but Rich has expressed a strong preference for small pieces in a forkful of rice, instead of big overwhelming whole chestnuts, so that's what I really do just for us. 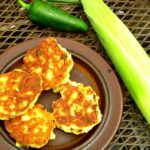 Easy dish made in so little time? I will take it! Plus i love chestnuts! 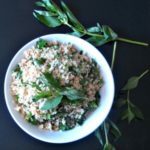 What a great quick and easy side dish! And sprouts are so underrated, I love them!